Non Sequitur sets the mood for our weekly retreat from politics, and not a moment too soon. Things have gotten to a point where even sober people feel the need for partisan divide. One of our grocery stores put a few tables in their deli section so people could sit and have a cup of coffee, but had to be told via customer complaints that, if they were going to blare Fox News throughout the deli and produce section, less rightwing shoppers were going to buy their food elsewhere. Management ordered the deli folks to keep it on Food Network and thus I suppose lost the patronage of a few people like the guys in Wiley’s cartoon, who wandered off in search of their freedom of speech. And if that needs balance, here’s a corrected meme that made me smile, because the original has been splashed all over social media in apparent self-refutation. I’m getting tired of the novelty of … the first female governor of this state. The first female African-American mayor of this city. When is it going to become the norm instead of the exception? 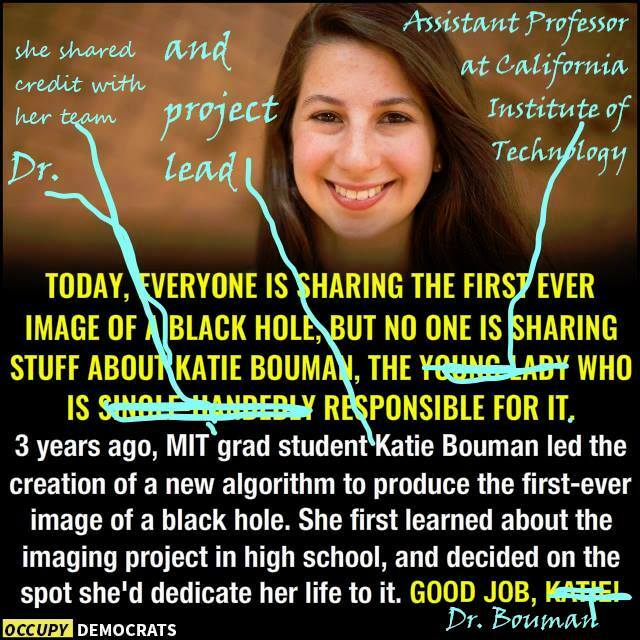 And now people are cutseying up this story to make little Katey — rather than Dr. Bouman, a post-doc at the time — an example of how, despite what everyone thinks, girls can do smart things! Well, please forgive my lack of surprise. Maybe I’ve just known too many, worked with too many, hired too many, worked for too many, smart, capable women. I wouldn’t want anyone to think I’m not in a good mood this bright spring morning, and Zits reminds me that I learned a very different version of this song before I had ever heard the original. One of the counselors at Camp Lord O’ The Flies used to also set the mood for the day, returning from the showers each morning cheerfully singing like Jeremy’s mom, only his frat-boy version went “Good Morning, Good Morning, How’ja like to bite my @ss, Good Morning, Good Morning …” and then swapped out one word but maintained the two-syllable scansion. I would not recommend Jeremy sing that version back to his mother, but perhaps he could get it printed on a book bag. Meanwhile, over at Loose Parts, Dave Blazek takes a standard gag setting and turns it into brilliance. This is a showstopper. I’d point out what Joe Martin did with the panhandler’s sign gag, but then we’d get into the whole “America’s Full” thing and that’s political. Still, if you want any freakin’ lettuce, you might want to book this guy before his schedule fills up. Google was just celebrating G-Mail’s 15th Anniversary the other day, which increases the laff Jeff Stahler gets for this Moderately Confused panel. I switched to Gmail early, though not soon enough to get my own name. People were early-adapting in hordes, but I eventually put my personal Gmail account on a forward from one domain I owned, and then created a second Gmail account for business, with a user name based on another domain which I owned then but sold three or four years ago. Which is to say that I have some sympathy for people who still have aol.com accounts, since I could simplify things if I didn’t feel too much time and too many contacts were involved. And, besides, Stahler’s right. Maybe some people see that extension and think you’re a dinosaur, but it also marks you as having been active on-line for quite some time. If that makes you the target of Boomer-Bashers, just chill, because their time is almost up. As he’s getting older, he’s a part of the Millennials. You’ve got some Gen-Zers coming up into the locker room, and they’re super, super sensitive, so you have to be able to manage them. ‘Scuse me, did somebody just notice the sun going down? Athletes work on a different life schedule than the rest of us, squeezing their careers into a decade, but if life comes at them faster, well, not many people had their reaction speed in the first place. And, as Drew reminds us, while most of us begin to smarten up about the time the athletes are retiring, we’re just working harder at something the best of them breezed through out of necessity. 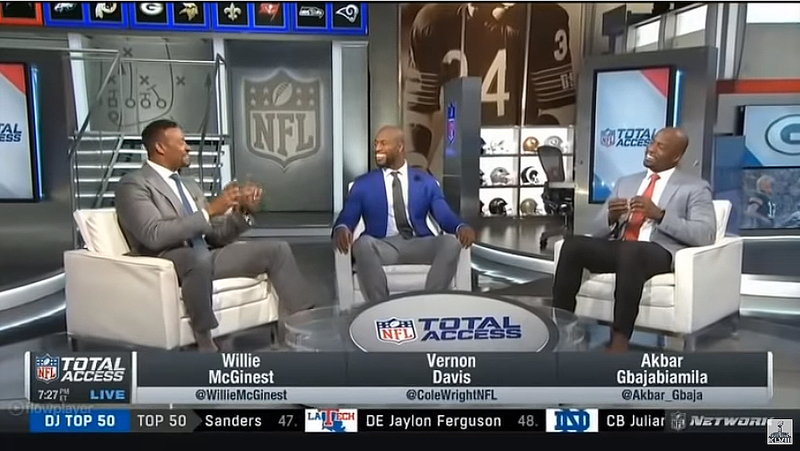 Go listen to that panel again. On the other hand, Marla’s a young manager, but she’s also a quick learner. 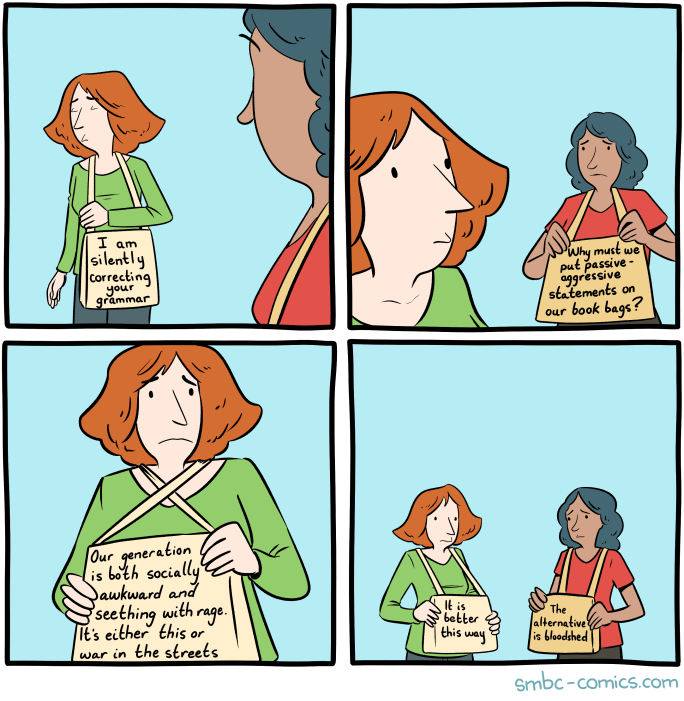 Well, within the limit that, if she really were a quick learner, there’d be no Retail comic strip because she’d have bolted Grumbels years ago. Let’s say she’s a quick learner but still driving on a poetic license. The then-owner of the syndicate I draw for insisted everyone get an AOL address so he could IM us any time he saw us on line. He’s gone, but I still have the AOL address. As well as the Yahoo! address I had beforehand. Yes, someday the “firsts” will stop being interesting. Meanwhile, thank you for posting the refutation of “L’il Doctor Katie” which I hadn’t seen. Tying together the thoughts in this column is the picture going around of Dr Bouman and the stacks of drives she used in her work, juxtaposed with the picture of programmer Margaret Hamilton and the stacks of program printouts from the moon launch. Society has moved, but technology has moved lightyears. That guy might be right about what “steep learning curve” originally meant, but it’s futile to try to reverse the usage of a word once the masses start using it differently. No one can use the word “bimonthly” without explaining whether they mean every two months, or two times a month. I managed to get my own name in a few places, like AOL chat. “Kip” had been taken, so I just used “Kip said” instead, and most people didn’t notice the “said” part. It was an invisible functor. The mime cartoon reminds me of the blank white button I had made for me at a convention. I wanted to speak up, but there was nothing in particular I felt like saying. Can’t discuss the “secure form” thing here. Come around to the back and knock three times. Make sure your phone is shut off. @ Hank Gilette – you literally could not be more correct. I edited a biweekly newspaper for awhile. Fortunately, I’d been briefed on the publisher’s intentions. 28 queries in 0.251 seconds.